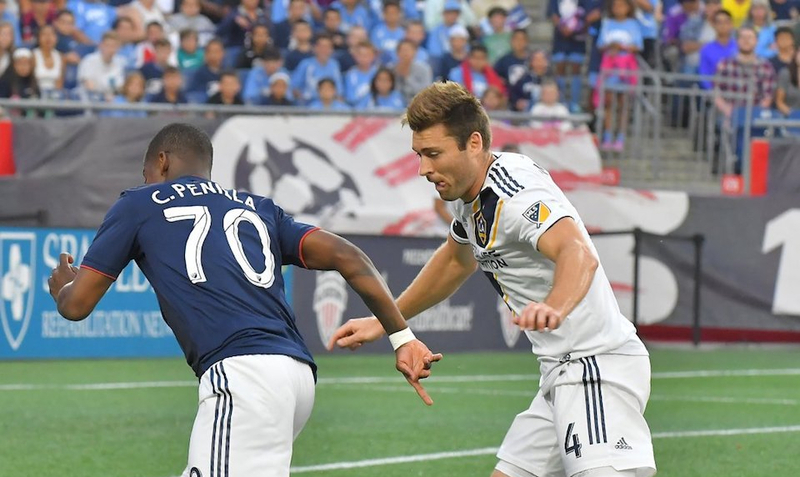 After 90 minutes, Saturday’s match between the New England Revolution and the Los Angeles Galaxy had seen plenty of action. The Revolution led 2-1 and both teams were playing with 10 men, but stoppage time had even more drama in store. The Galaxy tied the game in the 92nd minute off of a corner kick thanks to a back post header by David Romney. This wasn’t enough for the Galaxy though, as only a minute later they took the lead thanks to a second goal from Chris Pontius. Giovanni Dos Santos carried the ball into the box and sent the ball by Jalil Anibaba which set up Pontius for the game-winner. The madness began in the 23rd minute when New England’s Cristian Penilla received a red card after kicking Romain Alessandrini following a scrum. Despite playing down a man, the Revolution were superb on the attacking half of the field, evening pressing up the field more and more. The pressure paid off in the 28th minute, as the Revolution took a 1-0 lead through Diego Fagundez after he played a give and go with Luis Caicedo. Following the goal, the Revolution continued to mount offensive pressure, with Fagundez nearly scoring a second goal. The Galaxy leveled the game through Pontius in the 38th minute, however. Ashley Cole took the ball down the left side of the field and lobbed a cross over the entire Revolution defense. Pontius made a run in from the right side and volleyed a shot past a helpless Matt Turner. Despite the Galaxy equalizer, the 10-men Revolution continued to press offensively. Just before halftime, the Revolution took the lead again thanks to Caicedo, who scored his first goal for the club. Andrew Farrell took the ball down the right flank and put in a cross that Caicedo headed home—an unlikely feat for the 5-foot-7 midfielder. The Revolution continued to dominate throughout the second half but missed two big chances to extend their lead. The first came when Teal Bunbury had a shot cleared off the line by Cole in the 73rd minute and then Juan Agudelo hit the post in the 79th minute. Caicedo picked up a yellow card in the 84th minute, meaning he will miss the Revolution’s next game against Minnesota United. Cole also received his second yellow card and a red card for a foul on Agudelo in the 85th minute, which leveled both teams at 10 men. Revoltuion show resilience- Result aside, this was a tremendous performance from the Revolution. Aside from the final moments of the game, the Revolution were the better team in the game despite being down to 10 men. Instead of falling apart when down a man like last season’s team did, the Revolution showed a real fighting spirit in the game and put forward a solid performance. Unfortunately, they switched off for two minutes and the Galaxy made them pay in the end. Defense needs drastic improvement- While the Revolution played well, in the end, their poor defense was their undoing. All three Galaxy goals were incredibly preventable goals that could have been prevented by simple defensive plays. With the transfer window open, the Revolution desperately need to add more skilled and experienced defenders to their backline if they want to compete for a playoff spot. As seen on Saturday night, the current guard is not good enough. Caicedo continues to shine- One of the brightest stars in this game and this season is Luis Caicedo, who put forward probably his best performance as a Revolution player in the defeat on Saturday. Caicedo’s addition was scrutinized at first and not much was expected of the 22-year-old. However, the Colombian midfielder has been one of the Revolution’s best midfielders this season and is certainly making a case for the signing of the season. His goal and assist tonight only add to his accolades this season, where he has endeared himself to the fans and coaching staff through his raw pace and relentless work rate. The Revolution are fifth in the Eastern Conference and next face off against Minnesota United on July 18 in the first game of a three-game road trip. Kickoff is slated for 8 p.m. Due to suspensions, the Revolution will be without Penilla and Caicedo.